The Jerusalem Nano Bible Company website. Credit: Jerusalem Nano Bible Company. The Jerusalem Nano Bible Company said it has developed a five-by-five millimeter chip that contains the original Greek version of the New Testament and can be embedded inside of watches, jewelry, and more. “Our aim is to be able to mass produce it and cater to really every pocket. 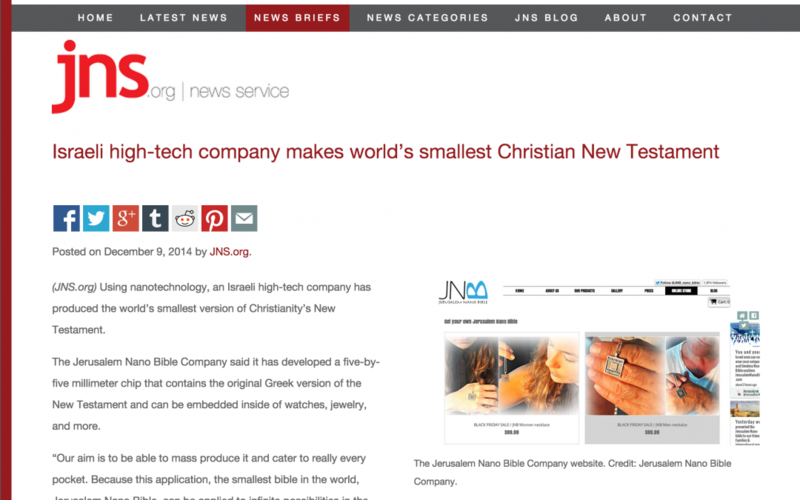 Because this application, the smallest bible in the world, Jerusalem Nano Bible, can be applied to infinite possibilities in the jewelry industry,” said David Almog, who heads the company’s marketing department, Reuters reported. “We have used 0.18 micron technology so the width of each of these letters is 0.18 micron to create the smallest printed bible in the world. In every one of these squares, which is about 1,000 of these squares on an eight inch silicone wafer, there is a little bit more than 1,000 bibles,” Russell Ellwanger from TowerJazz Semiconductor, whose company helped produce the bible, told Reuters. The nano bible is being sold on the company’s website inside of a necklace, which it describes as the “perfect Christmas gift” for $99. The company says it is working on a version of the much longer Old Testament (Hebrew bible) next.